The LORD God mode all kinds of beautiful tree grow there. WE ANTICIPATE the great Easter experience through our Lenten disciplines and finally through our participation in Holy Week. 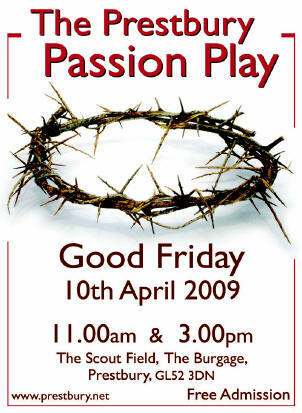 This year we have the Passion Play to look forward to. Many of us will have been living it for some time in our rehearsals when a great feeling of togetherness is engendered. And there is not much that can compare with seeing the play whether as a spectator or as a participant. It is a time to be feeling very spiritual. But then suddenly it is all over and we feel a little low. We even call the Sunday following Easter Low Sunday. It is right and proper that we should have such highs and lows, but we need to be a little more consistent as, indeed, God our father is consistent. His love for us does not wax and wane with the seasons. So where can we get our inspiration at such times? I dare to suggest that the saints give us all that we might need in this respect. During April there are many saints’ days being celebrated. Any one of them could be inspiration enough. On 16th April the death of St Bernadette of Lourdes is marked. A brief history of her life reveals poverty and ill health throughout her early years. Then when she was sent with her younger sister and a friend to gather firewood, a very beautiful Lady appeared to her above a rose bush in a grotto called Massabielle. She smiled at Bernadette and then made the sign of the cross. Bernadette fell on her knees, took out her rosary and began to pray. The beautiful Lady was the Blessed Virgin Mary. She appeared to Bernadette seventeen other times and spoke with her. Many people disbelieved Bernadette when she spoke of her vision, but one day Our Lady told Bernadette to dig in the mud. As she did, a spring of water began to flow. Many miracles happened when people began to use this water. It is a source of wonder that God works through very ordinary people in very extraordinary ways. Lourdes is now a major centre for pilgrimage. Many thousands of people have gone there in the last hundred and fifty one years since Bernadette was directed to dig in the mud and countless claims have been made of miracle cures. Why not let one of the saints, Bernadette if you like, be your inspiration when the inevitable low periods occur in your life? This year, on Sunday 26th April, the Meeting of Parishioners, followed immediately by the Annual Parochial Church Meeting (APCM), will be held in St Nicolas’ Church commencing at 6.30pm. The first meeting elects Churchwardens to serve for one year and can be attended by anyone who lives in the parish of Prestbury. The second meeting elects members to Deanery Synod and the PCC, receives the Annual Accounts and Annual Report, receives the Electoral Roll of the parish and includes an opportunity to raise ‘matters of parochial interest’. At this second meeting, only those whose names are on the parish Electoral Roll are eligible to vote. Please do check that your name is on the Electoral Roll and if not, complete one of the application forms which are available in both churches and on the parish website. Completed forms must be received by Wednesday 8th April 2009. After the APCM, refreshments will be served by members of the Prestbury & Pittville Youth Charity (PPY) and the PPY AGM will then follow on. For you to ‘have a voice’ at the annual meeting (see above) or to be eligible to be elected to an office you need to be on the church’s Electoral Roll. Each year the Electoral Roll is revised ahead of the meeting and this will take place beginning 8th April 2009 and will take effect from 11th April 2009. After this date no further names may be added to the Roll until after the annual meeting. The current Electoral Roll is displayed in both our churches. If you are not on the roll complete an enrolment form and hand it in by 8th April 2009 to one of the following: the Electoral Roll Officer (Brian Wood); the church wardens; the clergy; the team office. You qualify to be on the Electoral Roll of the Parish of Prestbury if you are aged 16 years or over on the date of the meeting, baptised, a member of the Church of England and either resident in the parish or you habitually attend public worship in the parish. The enrolment form is simple and can be found in church or you can download a copy from the parish website www.prestbury.net and follow the Electoral Roll link. There you will also find an interactive map of the parish so you can tell if you live in the parish. I am sure that you will agree that the poster for this year’s Passion Play is stunning. I asked its designer Hannah Horne to share some thoughts on its creation. Hannah, what were you aiming at when faced with designing the poster? I was aiming at impact, visual impact that would serve as an outreach mechanism as well as speaking to church members. I wanted a clean, crisp image. The poster needed to be easily readable. It needed to draw the attention of passers-by quickly and draw them in. I wanted it to be shocking. The subject matter is shocking. We know the story so well but can forget how violent the Passion is. I wanted it to have impact both on those with a faith and those without. What led you to choose the image of the crown of thorns? I considered using the icon of the cross but decided that it has become over-familiar as an image for those without a faith. To some degree it has become trivialised in its usage, eg in fashion. I wanted a simple, graphic, vicious-looking image that could draw everyone in: the crown of thorns. On a practical note, the design has maximum amount of usability. It can be reproduced in all sizes and will work in black and white as well as in colour. Please display this poster in whatever size or place. Hannah and her husband Peter with their three children have worshipped at St Nicolas’ for many years and also more recently at Celebrate! in St Mary’s. Hannah is a graphic designer operating under her trade name, Hebe Graphic Designs. Please take a poster and display it prominently. And do invite people to come and watch. Alan Jackson has been Secretary to the Hall Committee for far longer than originally intended. We are seeking a volunteer to take over from him to record minutes of the four meetings held each year and deal with the occasional item of correspondence. Word processing skills and access to emailing facilities are desirable and it would be good to have a person from within the Parish who understands the role the Hall plays in the community. Please consider whether this is a job you could do and ask Alan or me for a more complete ‘Outline of Functions’ should you want to know more. ON FRIDAY 6th March, we set off for Viney Hill full of excitement and a lot of noise! As we climbed into the two mini buses with our luggage all packed, we waved goodbye to our families who were looking forward to a peaceful weekend! When we finally arrived after the longest hour or so of our lives, we unpacked our bags and crowded into the room for the introduction to the centre. When the introduction was finished, we raced upstairs to our rooms to unpack. As we clambered for the bunk bed that we wanted, we prepared for the night-walk. I myself didn’t go on the walk, but from what I heard, it sounded like it was great fun! ‘It was great fun, especially the game, and the walk was quite easy but it was still all great fun!’ said George. When they arrived back at the centre, we all sat down and ate some cake, which was delicious! Then some of us went up to the dorms while the rest gathered for worship where we set ourselves targets for the end of the weekend and were again welcomed. The next morning, I woke up quite early (5.15) and in the process of finding my glasses woke up two others in my dorm who then started to make a racket and woke up the rest of the house who were really annoyed with us later on! At breakfast, we all gathered downstairs in our own time to eat. For each meal we took it in turns to provide the food for the rest of the group. After breakfast we went to prepare ourselves for our activities. Mine was canoeing. We left the house full of excitement now fully equipped with all of the kit we needed. We arrived where we were going to set off, but we had to carry the canoes down to the water then wait ages for the instructor to return. When he had shown us all of the strokes we needed, we finally set off and had to stick our faces in the water to thank the fish! When we got to the first rapid, we were all excited, and once we got through it we wanted to go through another, and another, and another. Then it was time to play a game. So in turn we all had to stand up and ‘make thunder’ by stamping really hard on the bottoms of the boats. Then we got to the roughest and largest rapid, which ended our seven mile trip! Funnily enough, I wasn’t tired, but everyone else was. We then drove up to a car park after attaching all the boats to the trailer to have our lunch. When we got back to the house, we relaxed until everyone else came back then went out to collect firewood. When it started to get dark, we tried to light the drizzle covered fire base and surprisingly succeeded! We had a great evening around the fire and had a jacket potato/soup/hot dog dinner with roasted marshmallows afterwards (if we hadn’t given them up for Lent which I had!) then all but four of us went back inside for a quiz. The four who remained outside (me and three friends) kept a watch over the fire for a while in case it did anything dangerous when we left. When we were sure it was safe, we left to see how the quiz was going. It was mostly a general knowledge quiz and one team got 100% so won a few packets of sweets between them. After another chance to have more cake (yum! ), we had another worship session which was about how far we were getting with our goals and how we were finding the weekend (excellent!!!!!! ), and then we went to bed after some more cake etc (yum). A great weekend to chill out and meet new people from other youth groups. Also great to see everyone work together as a team and interacting well together to explore the great outdoors. The next day I managed to not wake everyone up at 6 o’clock, when I woke up. Breakfast was at 8.30 and it was delicious because they brought out the hot cross buns as well as toast, which was a great surprise. Once we had finished breakfast, we had worship and said if we had reached our goals or not and whether we had enjoyed the weekend and our favourite parts of it. After worship we got ready for our activity somewhere in the forest: either the sculpture trail or stay at the base and do a scavenger hunt. I chose the sculpture trail which was quite fun because every time that I have been there I have seen something new. Once we were back at the van, rather damp from the light rain but slightly saved by the tree cover, we went back to the house to eat lunch and to start packing and tidying the house up. We loaded up all of the cars then had some final time to relax with our friends before piling back on to the mini buses to head home. The journey back was a lot quieter than the journey there, probably because everyone was so tired and knew that their excitement for the weekend was over. The general feeling at that point was sadness to be leaving our temporary home, but the thought of next year still hung in the air. Overall, Viney Hill was a great experience where we had fun, explored the forest, but most of all it was about working together and making new friends, and I know that I will hold the bonds of the new friendships for quite a while as I will see some of them again before next year. Let’s just hope we can go again because it was FANTASTIC! The AGM of Prestbury and Pittville Youth will follow the Parish of Prestbury APCM on the evening of Sunday 26th April in St Nicolas’ Church. The Executive Committee are also inviting everyone to join them for wine and nibbles between the two meetings. Prestbury and Pittville Youth is now five years old. There was an inaugural meeting on 30 November 2003 when PPY took over the running of the parish youth work and then the charity registration came through on 4 April 2004. Since then the numbers of young people taking part have grown, the range of activities has extended and, led by Andy Macauly, the work is continuing to flourish under our banner of ‘Involving, Supporting, Challenging’. At the AGM, members of Prestbury and Pittville Youth will be asked to vote for new members of the Executive Committee, who manage the charity. It is very easy, and totally free, to become a member. If you would like to join, please ask the Secretary, , for an application form. This is for young people aged 16-19 exploring the idea of ordained ministry in the Church of England. It takes place at Westcott House, Cambridge. The Shine a Light competition is now underway. Nearly nine hundred people turned up at Tewkesbury Abbey for the launch of the 2009 Year of the Child and to get the Shine a Light candle. We now have until 30th April to take that candle to as many places as possible, wherever there are children to light it! If you have any ideas contact Fr Daniel. Prestbury St Mary’s C of E Junior School will have vacancies on the Governing Body for foundation governors, to start their four-year term of office from 1st September 2009. Foundation governors are nominated by the PCC and appointed by the Gloucester Diocesan Board of Education. Their particular responsibility is to celebrate and foster the Christian Ethos within the school which, alongside quality education, ‘offers a spiritual dimension to the lives of young people, within the traditions of the Church of England in an increasingly secular world’ (from The Way Ahead: Church of England schools in the new millennium). If you are interested in applying for this opportunity to serve one of your local schools, please contact Fr Michael. Applications need to be received by the end of April. Printed below is the newest version of the Mothers’ Union prayer. For some, the old words did not seem all encompassing, and I hope that the newer words will be more favourable for you to accept. The change was brought about by the Mothers’ Union members in Africa, some of whom are outcasts from their families or single parents or divorced. They felt that they did not belong to the movement if it only welcomed married women. This is certainly not the case. The Mothers’ Union is open to all, male and female, and the only prerequisite is that you have been baptised. We welcome single mums, divorced ladies, in fact family life, in whatever category it presents itself. Please read the prayer below and, if you were unsure before, give me a call, with a view to joining a world-wide organisation that does so much for families around the world. Empowered by your Spirit, may we be united in prayer and worship, and in love and service, reach out as your hands across the world. On Shrove Tuesday – with our clergy – Jenny and Sylvia journeyed to Gloucester Cathedral for a Quiet Day led by the Rt Reverend Declan Lang, Bishop of Clifton. A very full day’s programme included three addresses given by Bishop Declan entitled: Journey into the wilderness, Journey to Jerusalem and Let me see again. We were given plenty of food for thought. The day had started with a welcome from Bishop Michael, who said the cathedral belonged to us and we were to feel free to sit where we liked, to pray and relax, or explore the cathedral between the various service. We sang hymns and enjoyed ‘Music in the Nave’ played by two musicians during an afternoon break. Father David was the Deacon for the mid-day Eucharist and he read the Gospel. Jenny and Sylvia agreed that it was a refreshing and beneficial day and recommend that you watch for the next Quiet Day and give it a try. The Alpha Course presents the basic principles of Christianity to people in a relaxed, informal setting. The first course, twenty-six years ago, was a small group at Holy Trinity, Brompton, in central London. Today there are over 33,500 courses worldwide in 163 countries. Do you know someone who would like to come to the Alpha Supper? This is the best way to find out about Alpha. We will meet for a relaxed meal at St Nicolas’ Church Room on 22nd April. If you, or someone you know, would like to come, please let me know by 15th April. Coming to the supper doesn’t oblige anyone to attend the course, but it does provide an opportunity to think about it. No-one is pressurized to make a decision, and both the supper and the course are absolutely free. Invitations are being sent out now, so don’t delay. There are three ways you can help to make the Alpha course run smoothly. First, and most important, is prayer. The groups will meet every Wednesday evening from 6th May for ten weeks. If you can spare even ten minutes to pray for those taking part in the course it will be greatly appreciated. Do let us know if you are doing this, or if you would like to meet with others to pray at a time that suits you. We will try to keep you informed of what is going on and provide you with resources to aid you in prayer. The second way is providing food. We are expecting about twenty people to take part this time (although you never can tell!). That means two groups, possibly meeting in different houses. If you let us have a receipt for the shopping we will reimburse you, and it doesn’t have to be cordon bleu, just good, basic food for about a dozen people (I expect we will have some pizzas ready as a back-up if anything goes wrong). I am hoping that this will be shared across the Team, so that each of the Churches will provide at least two meals over the ten weeks. If you can help in this way, please get in touch. The third way is to play host to an Alpha group. This only means letting them meet in your house on ten Wednesday evenings between Easter and the Summer holidays and is entirely separate from the cooking, which can be done elsewhere (it is very important that the work is shared out, so no-one is overburdened). Whether or not you decide to play an active part in Alpha do keep an eye out for news of what is going on. We will endeavour to keep all the Churches in the Team up to date with developments and are especially keen that you remember in your prayers those who are taking part. PRESTBURY ST MARY’S CofE Junior School has gone travel mad! They are creating a School Travel Plan, which looks at the issues, needs and problems of travelling to school. The main aim is to encourage the school community to be healthier by walking, cycling or scootering to and from school. Staff and pupils have been looking at their routes to school to identify where problems exist with road safety, the environment and health. Parents and pupils were sent a questionnaire and the information helped to build a picture. They have planned many activities, such as poster campaigns, art and poetry competitions, a dance routine in the Cheltenham dance festival and a ‘Bring your wheels to school’ day. All of these activities and more are aimed at raising awareness of what the school is trying to achieve. It is Mrs Bennett’s (Headteacher) hope that the school can build a weatherproof cycle shelter for the children and also construct a shelter where parents can wait when it is raining. More details about plans and ideas can be found on Prestbury St Mary’s school web site www.prestburystmarys.co.uk. 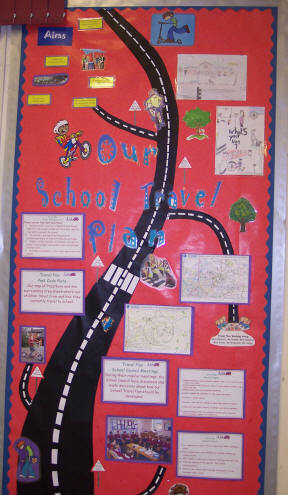 As school council, we got involved in the travel plan by hosting a competition of posters to put in the school travel plan folder. We also hosted another competition to help get people’s forms in. These forms were about your area & what you would like to improve, the person who won this won a scooter. As you can see we have been very busy trying to help improve our school. 1. Reduce traffic volumes, congestion and danger (whether real or perceived) and therefore improve road safety around the school. 2. Provide a sheltered waiting area for parents/guardians at drop-off and pick-up times. 3. Create a safer/cleaner environment outside the school to encourage more pedestrians, cyclists and scooter users. 4. Increase involvement in the travel plan within the school. ‘Hospitality and welcome are key themes of the Gospel. Over 80% of the population will visit a church during the year, perhaps for a service or simply because they feel drawn to go in.’ This is taken from the introduction to a report entitled ‘Developing a Ministry of Welcome in the Local Church’ which was presented to the Diocesan Synod in December by the Diocesan Missioner. Everyone you speak to will tell you how welcoming the people of St Mary’s are. The PCC and Fabric Committee have been reflecting recently on how welcoming St Mary’s building is to those who come, perhaps to join us for worship, perhaps to look round, or maybe just to sit quietly and pray. A small working party was asked to look at the welcome presented by the entrance area to St Mary’s and to report back to the PCC. On entering the church there is very little evidence of the life of the local faith community. We do not have somewhere near the entrance where we can display photographs or other information which conveys anything about the vibrant breadth of activities which are part of our Christian life together. When we have wanted to display work from our local schools, we have had to attach it to the walls in the area at the top of the north aisle. This is far from satisfactory and is also a long way from the entrance to the church. We are also aware that entering the church outside of service times usually means entering in semi-darkness and – for a visitor – negotiating two unfamiliar steps! The PCC propose a temporary experimental scheme which involves the removal of the pews against the south wall near the font, to the left hand side as you enter the church. Using temporary display boards this area would become the ‘welcome area’ to St Mary’s where we could put displays which speak about our Christian life together and also witness to the Good News which we wish to share with others. We will need to consider doing something about the condition of the floor in that area when the pews are removed and also explore the possibility of some lighting which might be activated when people enter the building. If extra seating is needed for a service, stacking chairs could be put out in this area. Before anything more is done, the PCC want to hear from members of the congregations at St Mary’s. This is part of the first stage of that consultation. Please feel free to speak to one of the Churchwardens, a PCC member or one of the clergy if you would like to discuss this further. If you wish to send a written response, please send it to the Churchwardens, c/o the Team Office, St Nicolas’ Church, Swindon Lane, GL50 4PA or email . The PCC will consider any comments raised by this consultation. If they decide to proceed, they will consult with our architect and then ask the Archdeacon to grant permission for a ‘reversible trial’, which can last up to fifteen months. At the end of that period, everything that has been removed can be replaced, or the PCC can apply for a faculty to make the changes permanent. Please give this your prayerful consideration. Try to look at the entrance area to St Mary’s through the eyes of a visitor, or someone tentatively enquiring about the Christian faith. Do please tell us what you think! Our annual jumble collection and sale will take place after Easter. This is the main fund-raiser for the Scout Group and we look forward to your continued support. The Scout Group is currently very active, especially since a new Beaver Colony was started up in February last year. We now have Beavers, Cubs, Scouts and Explorer Scouts taking boys and girls from age 6 to 18 years – a total of around 78 young people from Prestbury – and numbers continue to rise. The sections are very active and the Scout Troop came second in the recent County Cooking Contest held in February. 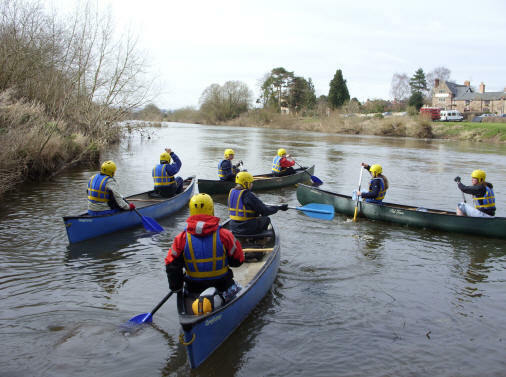 The Explorer Scouts have built two Canadian canoes, are involved in undertaking the Duke of Edinburgh Bronze and Silver awards, and are planning a summer camp in France. We have a new Group Scout Leader, Andy Jackson, and a new Chairman of the Executive Committee, Alex Dewdney. Work also continues to improve the Headquarters building in the Burgage with a new set of built-in cupboards for each section to store equipment. These tasks are not related to helping out with any of the sections, or running programmes for the young people; they are administration and support tasks. Our aim is to build up a larger and stronger team of people to support the work of the Leaders – who can then devote more time to developing enjoyable activities with larger numbers of young people from the Parish. None of these tasks requires large amounts of time, and the more people we have involved the easier it becomes to attract others to help. O LORD Almighty, who made heaven and earth, immeasurable and unsearchable is your promised mercy, and you relent at human suffering. In the multitude of your mercies you have appointed repentance for sinners, so that they may be saved. The sins I have committed are more in number than the sand of the sea; I am not worthy to look up and see the height of heaven. And now I bend the knee of my heart, imploring you for your kindness. I have sinned, O Lord, I have sinned; forgive me, O Lord, forgive me! For you, O Lord, are the God of those who repent. Unworthy as I am, you will save me according to your great mercy, and I will praise you continually all the days of my life. I was moved to tears the first time I read this prayer. Only fifteen verses, the writer spends eight telling God how awesome he is and reminding him that he has promised forgiveness to sinners; acknowledgement of sin and the plea for mercy make up the next six, and finally there is a commitment to continuous lifelong praise of God. The son of king Hezekiah, Manasseh became king of Judah at the age of twelve and ruled from c699 to c643 BC. Hezekiah had done ‘what was right in the sight of the LORD’ (2 Kings 18:3), tearing down the pillars and poles of idolatry. Manasseh, by contrast, ‘rebuilt the high places that his father had destroyed’ (2 Kings 21:3) and reinstated idolatrous practices. The account in 2 Chronicles 33 starts in similar vein, but differs in that Manasseh is taken captive to Babylon, where he undergoes a change of heart and prays to God, who ‘received his entreaty, heard his plea, and restored him again to his kingdom’ (v13). Manasseh seems now to be a reformed character, and does much to ban idolatry again. Then come the tantalizing verses: ‘the rest of the acts of Manasseh, his prayer to his God … are in the Annals of the Kings of Israel’ (v18) and ‘his prayer … is written in the records of the seers’ (v19). It is not known whether such records really existed; if they did they have not been found. But it proved impossible to leave such a gap, and this prayer was composed many years later. There are two known ‘prayers of Mannaseh’: this is the longer, and even this comes in more than one variation. It is thought to have been written by a Jew, probably in Greek, and probably in the second or first century BC. It is not part of the Jewish canon of scripture, and is not considered canon by most of the Christian Churches, the exception being parts of the Orthodox Church. However, as early as the third century AD it had become widely accepted in Christian liturgy. Today it is published in both Catholic and Protestant bibles as part of the Apocrypha. We use it here in Prestbury as a canticle in Morning Prayer during Lent (no 35 in Celebrating Common Prayer, 52 in Common Worship). We can all identify with the writer. Each of us falls short of God’s ideal… but idolatry – surely not? Yet where, I wonder, are our modern Asherah poles and high places? What things do we treat as more worthy of our time and attention than God? Let us consider again the awesomeness of God in creation; let us reflect on his ‘immeasurable and unsearchable mercy’. ‘Bend the knee of our heart’, acknowledge our shortcomings. God will save us (v15), and then ‘I will praise you continually all the days of my life’. This prayer feels like an antidote to the wallowing in self-pity that can sometimes surround confession. It encourages me to acknowledge that I am who I am, accept God’s forgiveness, and get on with life. Want to sing in a relaxed, friendly environment? Come and give St Mary’s Choir a try! No experience needed – just enthusiasm and a sense of humour! On Friday 3rd April at 6.30pm there will be an Open Choir Practice in St Mary’s church. Anyone and everyone is welcome to come along and join in, sing along or just watch – find out what really goes on at a choir practice! Tea and biscuits will be provided for those in need of sustenance. A small working group will be removing the cobwebs in St Mary’s on Friday morning 3rd April. Help will then be needed to clean the church on Friday afternoon and Saturday morning. 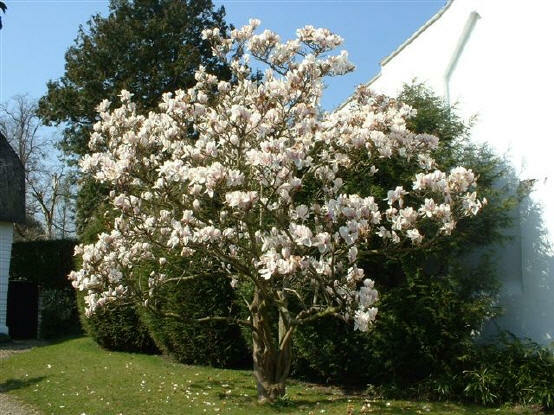 Also on Saturday morning 4th April the churchyard tidy up will be taking place with mowing, strimming, clipping etc. Any help that you can provide for the church clean or churchyard tidy will be most welcome. Please bring any tools that you may need. If you would like to contribute towards Easter lilies at St Nicolas’ in memory of someone, please leave your donation in the envelopes in the lobby. Lilies are £1.50 a stem. The Easter Festival will soon be with us and our church will be lovingly decorated with Easter flowers. You are again invited to sponsor an Easter Lily in memory of a loved one. Last year many of you commented how comforting it was to remember someone in this way. Envelopes will be available in the flower bowl for your donations. There will also be a card for you to write the name of the special person you are remembering. Our part for the Wave of Prayer is on Wednesday 15th April at St Nicolas’ from 12.30pm until 1.30pm. Anyone is welcome to join us for all or part of this prayer time – you don’t have to be a member to come and pray with us! The date for the April bakestall is Sunday 19th April, when the providers will be the G-M team. The money raised in February and March amounted to £85, which was worth four times as much to Care International under the European Union scheme. Splendid! After a short break our amateur dramatic group will meet again on Friday 24th April at St Nicolas at 7.00pm. We welcome back all current members and any new ones who feel they would like to join us. You don’t have to be a professional thespian – we are all very much on a learning curve and any new ideas or talents would be appreciated. Our plan is to present something similar to last year around St Mary’s Patronal Festival in September. The exact date will be confirmed later. Meanwhile, we will pool any thoughts and ideas at our first meeting. We look forward to seeing you on 24th April. In February we held our AGM and Eucharist, led by Father Michael. We are indebted to him for his support and appreciate his leading this annual Eucharist service for us. This month’s meeting will be at the United Reformed Church on Tuesday 28th April starting at 7.30pm. Our speaker will be Sophie Rollin, who will tell us about the benefits of Aloe Vera. Visitors are welcome to join us for any of our meetings. We welcome Roger Hodges as the Christian Aid organiser for the St Mary’s part of the parish. He would love to hear from you if you are able to volunteer to help collect during Christian Aid Week (see below) or if you can help with counting the money afterwards. After the wonderful collective effort made for the Passion Play, your help is needed again in May for Christian Aid Week’s house-to-house collection. This is Christian Aid’s main fundraising event, which is the ‘largest single act of Christian witness in the UK’, and which raises more than £10 million through 300,000 collectors nationally. Could you be one of those collectors, here in Prestbury, joining the loyal group who have been helping for many years and who are getting older and, in some cases, too frail to continue? It need take no more than three hours of your time to collect from 30-40 houses. Collectors must be at least sixteen years old. On Saturday 6th June at 4.30pm Fr David will be ordained priest in Gloucester Cathedral. Nearer the time we will be considering whether to organise a coach to take people over to the service. We hope that he will be well supported by members of our North Cheltenham Team Ministry. On Sunday 7th June (Trinity Sunday) Fr David will preside at the Eucharist for the first time. This is a very significant occasion for a new priest and one which we would all want to share in. As this will be a Team-wide celebration we will not be having services in the churches of the Team Ministry at the normal times in the morning. There will be a Said Eucharist at 8am in both St Mary’s and All Saints’. The main Sung Eucharist, at which Fr David will preside, will be at 11am in St Nicolas’. This will be followed by lunch, details of which will be available nearer the date. Please make a note of these significant dates so that you are able to join Fr David in the celebrations. The Parish Fete will be held at St Nicolas’ on Saturday 27th June from 2.00pm onwards. You will have seen the notice in the pew sheet regarding the MU trip to Winchester Cathedral on Tuesday 28th July. The cost, including a guided tour and the transport, will be £13.00 return per person. All are welcome to join us for a day out, leaving St Nicolas’ church at 9.30am and returning from Winchester at 4.30pm. Please contact me for a form. THANK YOU to everyone who helped with the Gold Cup parking and refreshments at St Nicolas’. This year we raised £2,800 for church funds.